On a busy day on the Tideway, Oxford University Women’s Boat Club lined up against Molesey Boat Club for two pieces. The first from the start of the Championship Course in Putney to Chiswick Eyot, the second from Chiswick Eyot to the Championship Course finish post just before Chiswick Bridge. Both crews executed their warm-up routines on separate stretches of the water, and met at Putney Railway Bridge, where they paddled through to the start line. Off the start of the first piece, with Oxford on the Middlesex station and Molesey on the Surrey station, Molesey lead out to a quarter of a length lead over Oxford. Approaching Fulham Football ground, the bend was in Oxford’s favour, and, with warnings of steering from umpire Sir Matthew Pinsent against Molesey, the crews were level coming onto the straight section before Hammersmith Bridge. Oxford’s rhythm along this straight gave them a quarter of a length advantage before the bend which favoured Molesey could put them at a disadvantage. Despite being on the outside of the bend, Oxford continued to build on this lead on the outside, and crossed the finish line first in a verdict of one and a half lengths. In the second piece, Molesey, on the same station as before, once again led off the start and used the bend before the crossover to their advantage. As the river bent to favour Oxford, the crews were level coming underneath Barnes Bridge. In the remaining three minutes of the race, Oxford and Molesey traded pushes, and neither crew had a clear lead over the other approaching the finish line. Clearly Molesey had learned from the first piece and were not going to let Oxford get ahead in the same way. 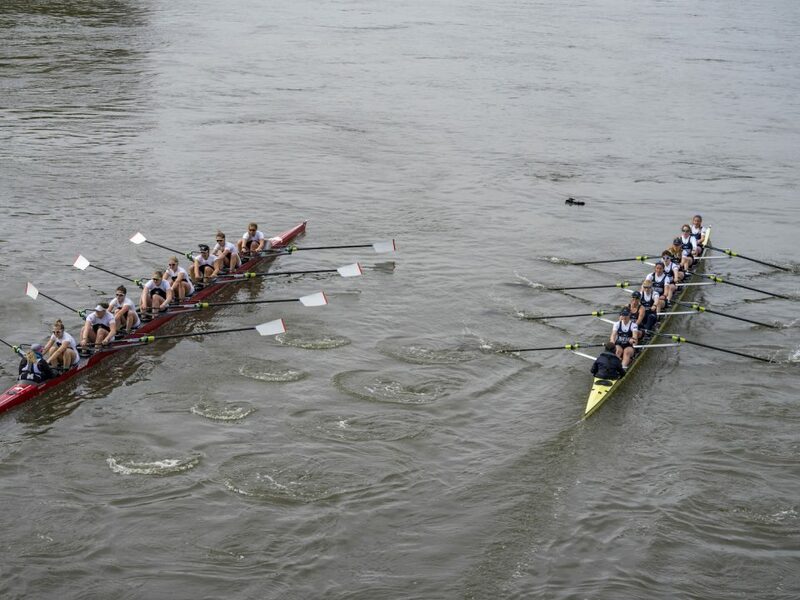 In the final strokes, Oxford managed to get their bows in front and crossed the line ahead in a verdict of a quarter of a length. With only two weeks left until Race day, this closely-fought side-by-side racing will be invaluable to Oxford. Extending their lead on the outside of the bend at Hammersmith will give them confidence that they can still overtake a crew in such circumstances.